We love working Kohl's each year to tell you about the new season's offerings from the Kohl's Cares for Kids Program. If you are on a budget -- like we are -- you will appreciate that you can buy high-quality, hardcover books and soft plush toys for just $5 each! What's included this year? The Kohl’s Cares program gives 100 percent of the net profit from the sale of the featured books and plush toys to benefit kids' health and education initiatives in communities nationwide. Since its inception, Kohl’s has raised more than $180 million to help kids. You can learn more about the program at the official Kohl's Cares for Kids webpage, and you can purchase these items at your local Kohl's store or online now through the end of April! Wanna Win? We are giving one lucky reader a chance to win a prize pack from this program. The winner will get four children's books (Brown Bear, Brown Bear, What Do You See?, 10 Little Rubber Ducks, Does a Kangaroo Have a Mother, Too? 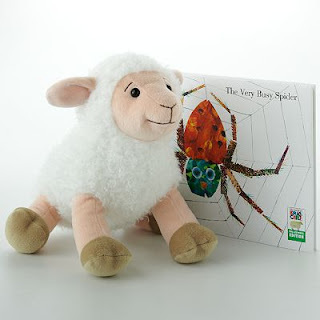 and The Very Busy Spider), a plush lamb (like in the photo above), and the Crazy About Cookies Book! To be entered to win, just tell us which of the books you think your child will like to read most. You have until April 1st at 11:59 pm CST to get your entries in, and winners will be randomly selected from all eligible entries. You may enter every day and we will pick one winner at random from all eligible entries. (Please answer the question for the first entry. Each entry after that can be "enter me.") This giveaway is open to U.S. residents ages 18+. See our full rules here. Don't forget to enter our other blog giveaways while you are here. I think my grandchildren would like The Very Busy Spider. They would like Brown Bear, Brown Bear, What Do You See? <3 brown bear, brown bear, what do you see? I think my children would like The Very Busy Spider. I think my son would like Brown Bear, Brown Bear, What do you See? I think she would like The Very Busy Spider. I think my daughter would like the kangaroo book. I think my daughter would LOVE 10 little rubber ducks! Thanks for hosting! My daughter would probably like the 10 Little Rubber Ducks book the best. She loves her bath duckies. I think The Very Busy Spider will be popular at our house! I think my boys would like , Does a Kangaroo Have a Mother too? I think Does a Kangaroo Have a Mother, Too? would be a favorite. Brown Bear, Brown Bear. It was a favorite of mine when I was younger! My daughter will love Brown Bear, Brown Bear, What Do You See?. The kids would like The Very Busy Spider. I don't currently have any children but I like to collect children's books for when I do. "Brown Bear, Brown Bear, What Do You See?" is a classic and I can't wait to share it with my first child! Brown Bear, Brown Bear would be our favorite. Enter me please - Mar 28. My nephew would love "Does a Kangaroo have a mother too? When my daughter was little she loved this book.....wish I still had it too see if she would remember it. I think theyll like the book about Rubber Ducks...we have tons of them and they love playing with all the duckies, so they'd love this book! BROWN BEAR! Without a doubt. "Brown bear, brown bear, what do you see... I see a [teacher] looking at me! Teacher, teacher, what do you see, I see [mommy!] looking at me"
My kids will love the book about the ducks or spider. The Very Busy Spider because E. loves bugs! My daughter loves ducks so I think she will read the 10 little rubber ducks the most. I think we would most enjoy The Very Busy Spider but, all his books are great! I think they'd enjoy The Very Busy Spider. He would love the 10 little ducks and the very busy spider the most! My kids would like to read (Brown Bear, Brown Bear, What Do You See? We'd especially like Brown Bear! They would probably like Brown Bear, Brown Bear, What Do You See. I think they would like them all though. My daughter would like Brown Bear, Brown Bear. I think my daughter would love 10 Little Rubber Ducks the most. My kids would love the Brown Bear Brown Bear What do you see? definitely:Brown Bear, Brown Bear, What Do You See? My children loved it. I think my grandson will love it as well! My son would love to read Brown Bear, Brown Bear! we have never read Does a Kangaroo Have a Mother, Too?, so that would be my choice. my grandson would love brown bear brown bear what do you see. My son would love The Very Busy Spider! Thanks so much for the giveaway. I think my daughter would love "the Very Busy Spider." How cute are these books? I think my Granddaughter Alice would love 10 little rubber ducks the most. The very busy spider will be our favorite. She would probably like Crazy about Cookies. She would love to read Does a Kangaroo Have a Mother, Too? I think they'd like The Very Busy Spider. Thanks.